The Nonpoint Source (NPS) Outreach Toolbox is intended for use by state and local agencies and other organizations interested in educating the public on nonpoint source pollution or stormwater runoff. The Toolbox contains a variety of resources to help develop an effective and targeted outreach campaign. EPA's Getting in Step Outreach Series: A great place to get started and learn how to develop effective outreach. The series includes EPA's flagship publication, Getting in Step: A Guide for Conducting Watershed Outreach Campaigns, which presents the outreach development process as a logical, easy-to-apply sequence of steps. Information is also provided on related resources, including a free video companion guide and training workshop opportunities. Featured Products: Exemplary outreach examples culled from the catalog for increasing awareness and changing behaviors across each of the six targeted topics (general stormwater and storm drain awareness, lawn and garden care, pet care, septic system care, motor vehicle care, and household chemicals and waste) and organized by media type. 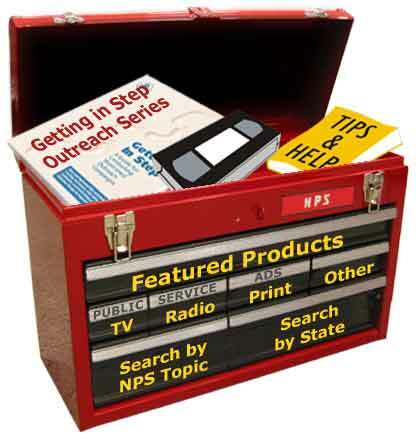 Searchable Toolbox Catalog, by NPS topic or Keyword: Contains more than 700 viewable and/or audible TV, radio, and print ads and other outreach products to increase awareness and/or change behaviors across six common topics (see "Featured Products"). Search by NPS topic or keyword. Permissions for using the cataloged products are disclosed (and in most cases, granted) by the product owners, and contact information, campaign websites, and other pertinent details are provided. Search by State ("Where You Live") Catalog Search Option: Allows products to be searched by state. Logos, Slogans, and Mascots: Ready-made identifiers to brand outreach campaigns and make them memorable. Surveys and Evaluations: Surveys of public attitudes and perceptions regarding NPS problems and solutions, and evaluations of the effectiveness of some local NPS media campaigns. Media Campaigns: Links to collections of products that were developed by an agency or organization around a specific theme. Other NPS Outreach Collections: Links to collections of NPS outreach and educational products compiled by states and other organizations. Tips, Help and Frequent Questions: For using the many features of this Toolbox.